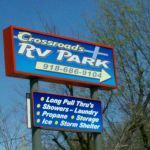 Ask fellow campers about "Crossroads RV Park" and nearby attractions. Convenient place to stay with WiFi and cable. Great owners, clean and room to walk the dogs. We stayed out front in what I would guess they call the overnighters spots. Fairly quiet and easy in and out. As others have said cash or check only. We camped at Crossroads RV Park in a Motorhome. Muskogee has all the advantages of a larger city while retaining its small-town charm. 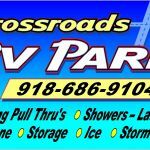 Are you affiliated with Crossroads RV Park ?